It took me some time to realize a screen saver identical to the YouTube videos in my former post, showing 30 of the finest pictures from various catalogues and of all versions of the 124 Spider during several decades. And to make sure that - apart from watching - you will enjoy listening too, I fixed the screen saver up with three different types of easy-listening background music. To find out what music pleases you best, I've cut a short fragment out of each of the three pieces of music to make your choice easier. that can be listened to HERE and the installation file (about 190 MB) can be downloaded HERE . that can be listened to HERE and the installation file (about 200 MB) can be downloaded HERE . that can be listened to HERE and the installation file (about 260 MB) can be downloaded HERE . 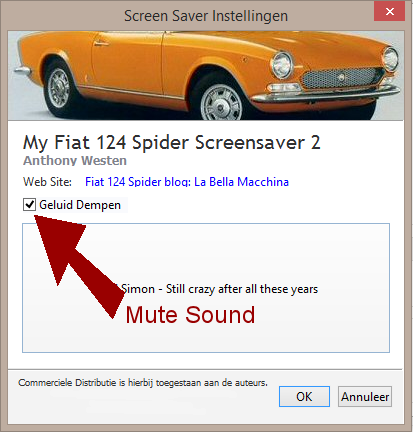 For those who enjoy a silent screen saver: I built in a ' MUTE ' - OPTION in the Settings-box. 2 and 3 are self-installing programs. In most cases the dowloaded .exe file will be placed on your desktop with a specific icon or else you will find the file in the directory My Documents or in Downloads on your C-drive. Double click this desktop icon or the .exe-file of the just downloaded MyFiat124SpiderScreensaver1.exe file (or file 2 and 3.exe depending on your choice) and the screen saver will be installed automatically. and move the file to your ' Windows\system32 ' directory or your ' Windows\Sysnative ' directory, depending on the Windows system you are running. After installation right-click on your Windows desktop, choose Properties and click on the tab Screen saver. Select the screen saver from the drop down menu and enter the time of the wait before the screen saver starts. Click the button Settings to enable or disable the sound and finish the configuration by clicking the button OK. Enjoy my unique Fiat 124 Spider screen saver.